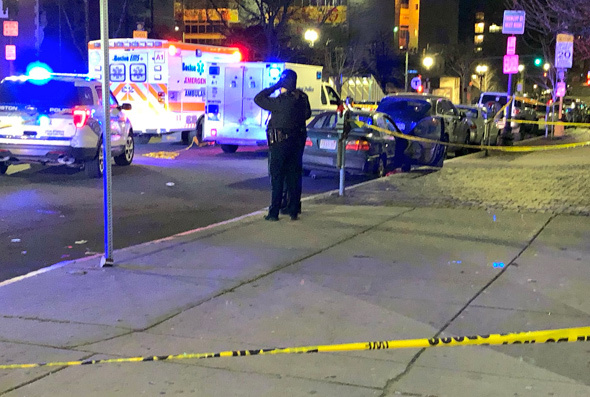 KMV shows us the crime scene on Tremont Street next to Eliot Norton Park, where first responders found an unconscious man lying on the ground, stabbed to the back, shortly before 1:30 a.m. Doogs reports the victim may have been stabbed on the other side of the park, on Charles Street South. I always wondered why some people are afraid to venture into Roxbury or Dorchester which have some wonderful restaurants but will wait in line for an hour for mediocre food in the Theater District where violence appears to be out of control. No one who lives in Boston waits in line for an hour for restaurants in the theater district. Most likely the in line crowds you see are suburbanites who have theater tix or are going to a club. Any suggestions on good restaurants in Roxbury? Been to a few in Dorchester. Calling violence "out of control" in the neighborhood is ridiculous. You must not live close by. Can't image why you would post that.